The Coalition will provide oversight, guidance, and leadership for the Nunavut Food Security Strategy, as well as the development, implementation, and evaluation of associated action plans. 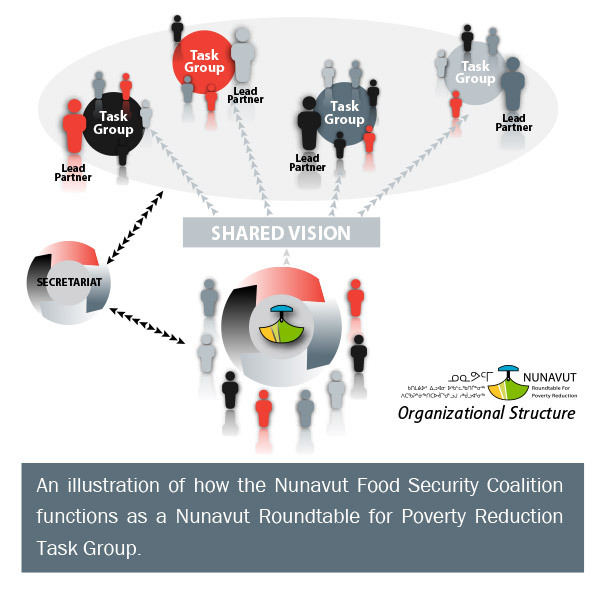 The Nunavut Roundtable for Poverty Reduction provides leadership and oversight to the Nunavut Food Security Coalition. The Coalition is a Roundtable Task Group, because increased food security is linked to reduced poverty. Coalition members are accountable to the Roundtable and to each other. The Coalition is co-led by Government of Nunavut (Department of Family Services) and Nunavut Tunngavik Inc. (Social and Cultural Development Department). 1 Strengthen the Nunavut Food Security Coalition. 2 Promote public awareness of the food security issue through a variety of media. 3 Link our efforts to other strategic actions that complement our collective vision for food security in Nunavut. 4 Utilize existing assets effectively by promoting the coordination and integration of services and resources. 5 Advocate for progressive changes in existing programs and policies to improve food security. 6 Ensure accountability of the Coalition in the implementation of the Nunavut Food Security Strategy.